Although hikers and walkers often prefer to undertake their chosen activity in groups as, for those who prefer it, it’s as much about socialising as enjoying the great outdoors, there are equally a large number of people who enjoy doing this alone. Many solo walkers will often point to the fact that they find it far more therapeutic to walk alone as they’re able to take in more of their surroundings and enjoy the natural environment and the sights and sounds of the birds and other wildlife without the intrusion of the presence of others and it allows them to connect themselves with the natural world around them in a much deeper way, emotionally, which they feel they couldn’t achieve if they were hiking or walking as part of a group. Indeed, there is absolutely nothing wrong or strange about wanting to hike solo and it could be argued that we might all benefit from seeking additional solitude in this way on occasion to escape the pressures of everyday life. Nevertheless, if you are out walking solo, you should take some additional considerations into account. Getting lost in an unfamiliar area or, worse still, getting injured whilst out is going to put you in a more precarious situation than if you were walking as part of a group who could assist you. Therefore, if you’re solo walking, stick to the trails and routes you’re familiar with and which others find popular too. You can still find your own solitude out there but if you get into difficulty, at least you’ll be fairly certain that help isn’t too far away. This is probably more of an issue in areas of the world where more dangerous predators may be present but it’s worth mentioning. So, in areas where they’re might be animals such as bears, larger members of the cat family or even in the UK where wild boar or stags in the rutting season might potentially cause a problem in certain locations, be sure that you’re always creating a little bit of noise along the way to let them know you’re approaching so as not to surprise or panic them by your sudden appearance which has been known to provoke an attack which is obviously more fraught with danger if you’re hiking alone. This doesn’t mean your sense of peace or solitude needs to be shattered. 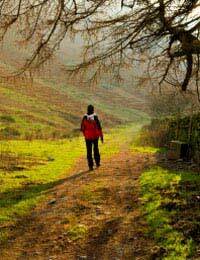 Taking heavy steps or simply humming, whistling or singing a song as you stroll along might even help to add to your feelings of tranquillity. And, whilst we’re on the subject of music, however, do not under any circumstances hike alone whilst wearing headphones. Your sense of hearing all that is going on around you is even more important when out solo walking and, after all, isn’t listening to the sounds of nature, as opposed to other people’s conversations, one of the main reasons for going out hiking solo? You need to plan a little more carefully ahead of time if you’re going out solo walking. Be more prepared to carry items like a whistle, a distress alarm and, perhaps even flares if you get lost or get injured as these will get you noticed over a longer distance than by simply yelling alone which might be extremely important if you’re hiking in more remote areas. Make sure you’ve checked things like the weather forecast and any information you’re able to gather about the trail conditions before setting off. You’d do this if you were walking in a group anyway but it’s even more important to do so if you’re hiking alone and to postpone any trip if adverse weather conditions are forecast. As with in groups, be sure to let somebody back home know your intended route before you go and your expected return time and carry a mobile phone with you which might also be very beneficial if you run into difficulty. Some solo walkers will also adopt a tactic of following not too far behind an existing group of walkers along a trail. That way, they can still enjoy their solitude yet can take great comfort of knowing that others are close by if they get into trouble. Nobody should be put off solo walking. All the advice contained here is not meant to alarm you but just to make you aware of the additional considerations you should take into account. The most fundamental aspect of solo walking, however, is that it’s something you really want to do and are confident in doing because if the very thought of it makes you nervous then perhaps you’re better off sticking to walking in groups and seeking your solitude elsewhere. However, for many thousands of walkers and hikers, going solo is the only way to go and it’s probably true that this method does enable you to establish a deeper relationship with the natural world around you and gives additional meaning to your walk than hiking with a group and the distractions that come with that sometimes could ever hope to achieve.